نهشته­های بخش قدیر از سازند نایبند در خاور ایران مرکزی گسترش بسیار زیادی دارند. بررسی رخساره­های سنگی و محیط رسوب­گذاری بخش قدیر از سازند نایبند به سن تریاس فوقانی در بلوک طبس در خاور ایران مرکزی، منجر به شناسایی نهشته­های دشت ساحلی، دلتایی و دریای باز شده است. با توجه به شواهد صحرایی، ویژگی­های رخساره­ای و شکل هندسی لایه­ها، این بخش از دو رخساره سنگی سیلیسی و کربناته تشکیل شده است. رخساره­های آواری شامل 4 رخساره ماسه‌سنگی (دانه‌متوسط) Sr، Sh، Sp و St و 3 رخساره سنگی دانه‌ریز Fl، Fm، (Sr)Fl /(Fl)Sr و یک رخساره زغالی (C) است. رخساره­های کربناته نیز در اندازه دانه‌درشت (کلسی‌رودایت) و دانه‌متوسط (کالک‌آرنایت) شناسایی شدند. با توجه به مطالعات صحرایی، آزمایشگاهی و شناسایی رخساره­های سنگی، محیط­های دشت ساحلی، دلتایی (شامل دشت دلتایی، بخش بالایی جلو دلتا، بخش انتهایی جلو دلتا و پاشنه دلتا)و دریای باز برای بخش قدیر شناسایی شد که این بخش از سازند نایبند تحت نفوذ جریان‌های جزرومدی قرار گرفته است. Qadir Member of Nayband Formation in the eastern part of central Iran have a wide outcrop. Investigating the lithofacies and sedimentary environment of Qadir Member of Nayband Formation (Upper Triassic) in east central Iran, Tabas Block, resulted in identifying the coastal plain, deltaic and open marine deposits. Based onfield evidences, the facies features and the geometry of beds, this member consists of two lithofacies include carbonate and siliciclastic facies. The siliciclastic facies were identified as having four sandstone facies (medium-grained), including Sr, Sh, Sp, St and three fine-grained lithofacies, including FI, Fm, Fl (Sr) / Sr (FI) and one coal facies (C). Also carbonate facies are calcirudite and calcarenite. Regarding the field, laboratory studies and identifying the lithofacies, the coastal plain, deltaic (including deltaic plain, proximal delta front, distal delta front, and prodelta) and open marine environments were identified for Qadir Member on which it is under the impact of tidal currents. آقانباتی، س. ع.، 1385- زمین­شناسی ایران، سازمان زمین­شناسی و اکتشافات معدنی کشور، 586 ص. آقانباتی، س. ع.، 1388- فرهنگ چینه‎شناسی، جلد سوم (تریاس)، سازمان زمین­شناسی و اکتشافات معدنی کشور، 727 ص. بایت‎گل، ئ.، 1395- رسوب­شناسی و اثرشناسی نهشته­های دریای باز تحت تأثیر امواج و دلتای رودخانه­ای سازند نایبند (تریاس بالایی) در بلوک طبس، ایران مرکزی، فصلنامه علوم زمین، سازمان زمین‌شناسی و اکتشافات معدنی کشور، شماره 99، صص.47 تا 60. زندمقدم، ح.، موسوی حرمی، س. ر. و محبوبی، ا.، 1388-آنالیز رسوبات جزرومدی کوارتزیت رأسی در شرق زرند کرمان، پژوهش­های چینه‌نگاری و رسوب‌شناسی، ج 25، ش 2، صص. 1 تا 18. لاسمی، ی.، 1379- رخساره­ها، محیط­های رسوبی و چینه‎نگاری سکانسی نهشته سنگ­های پرکامبرین بالایی و پالئوزوییک ایران، سازمان زمین­شناسی و اکتشافات معدنی کشور، 180 ص. مسعودی، م، ناظمی، م.، فریدی، م. و نعیمی قصابیان، ن.، 1383- نقشه زمین­شناسی غرب شکسته آبشاله، 1:100000. موسوی حرمی، س. ر. 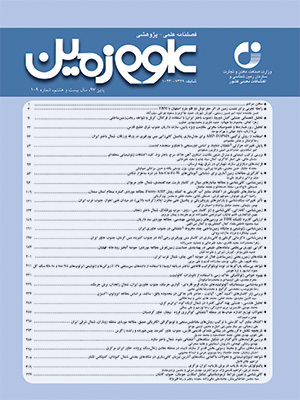 و قائمی، ف.، 1385- نقشه زمین­شناسی کُریت، 1:100000. Bos, I. J., 2010- Architecture and facies distribution of organic-clastic lake fills in the fluviodeltaic Rhine-Meuse system, The Netherlands. Sedimentary Research, V. 80, p. 339-356. Bronifman, P., Zaninetti, L., Bozorgnia, F., Dashti, G. R. and Moshtaghian, A., 1971- Lithostratigraphy and foraminifera of the Triassic Naiband Formation, Iran. Revista de Micropaleontologia France, 14: 0005, p. 7-16. Cadjenovic, D., Kilibarda, Z. and Radulovic, N., 2008- Triassic to Late Jurassic evolution of the Adriatic carbonate platform and Budva Basin, Southern Montenegra, Sedimentary Geology, V. 204, p. 1-17. Carlos, A. U. and Ronald, J. S., 2008- A highstand shelf-margin delta system from the Eocene of West Spitsbergen, Norway. Sedimentary Geology, V. 203, p. 229-245. Catuneanu, O., 2003- Sequence Stratigraphy of Clastic Systems. Geological Association of Canada, Short Course Notes, V. 16, p. 248. Coffey, B. P. and Read, J. F., 2004- Mixed carbonate - siliciclastic sequence stratigraphy of a Paleogene transition zone continental shelf, Southeastern USA, Sedimentary Geology, V. 166, p. 21-57. Cotter, E. and Driese, S. G., 1998- Incised valley fills and other evidence of sea level fluctuations affecting deposition of the Catskill formation (Upper Devonian), Appalachian Forland Basin, Pennsylvania. Sedimentary Petrology, V. 62, p. 1130-1146. Dalrymple, R. W., Zaitline, B. A. and Boyd, R., 1992- Estuarine facies models: Conseptual basis and stratigarphic implications. Sedimentary Research. V. 62, p. 1130-1146. Davis, R. A., 2012- Tidal signatures and their preservation potential in stratigraphic sequences. In: Davis, R.A. and Dalrymple, R.W. (Eds. ), Principles of Tidal Sedimentology. Springer, p. 35-55. Douglas, J. A., 1929- A marine Triassic fauna from eastern Persia. Geological Society of London, V. 340, p. 624-650. Dunham. R. J., 1962- Classification of carbonate rocks according to depositional texture, American Association of Petroleum Geologists Bulletin, V. 1, p. 108 - 121. Einsele, G., 2000- Sedimentary Basin: Evolotion, Facies and Sediment Budget (2th Ed). Springer Verlag, p. 292. Fielding, C. R. and Frank, T. D., 2015- Onset of the glacioeustatic signal recording late Palaeozoic Gondwanan ice growth: New data from palaeotropical East Fife, Scotland. Palaeogeography, Palaeoclimatology, Palaeoecology, V. 426, p. 121-138. Flugel, E., 2010- Microfacies of carbonate rocks, analysis interpretation and application. Berlian-Heidelberg, New York, Springer, p. 976. Folk, E., 1980- Petrography of Sedimentary Rocks. Hemphill Publishing Company, p. 182. Fürsich, F. T., Hautmann, M. T., Senowbari-Daruan, B. and Seyed-Emami, K., 2005- The Upper Triassic Nayband and Darkuh formations of east-central Iran: Stratigraphy, facies patterns and biota of extensional basins on an accreted terrance. Beringeria, V. 35, p. 53-133. Gingras, M. K., MacEachern, J. A. and Dashtgard, S. E, 2011- The potential of trace fossils as tidal indicators in bays and estuaries. Sedimentary Geology, V. 279, p. 97-106. Grabau, A. W., 1904- On the classification of sedimentary rocks, Am. Geol, V. 33, p. 228-247. Harms, J. C., Southard, J. B. and Walker, R. G., 1982- Structures and Sequence in Clastic Rock. SEPM, Short Course, Chapter 1, p. 55. Higgs, K. E., King, P. R., Raine, J. I., Sykes, R., Browne, G. H., Crouch, E. and Baur, J. R., 2012- Sequence stratigraphy and controls on reservoir sandstone distribution in an Eocene marginal marine-coastal plain Fairway, Taranaki Basin, New Zealand. Marine and Petroleum Geology, V. 30, p. 175-192. Kluyver, H. M., Triw, R., Chance, P. N., Johns, G. W. and Meixner, H. M., 1983- Explanatory text of the Naibandan Quadrangle map, 1: 250000. Geological Survey of Iran, Reportes No. 18, p. 143. Kosters, E. C., 1989- Organic-clastic facies relationships and chronostratigraphy of the Barataria interlobe basin, Mississippi delta plain. Sedimentary Research, V. 59, p. 98-113. Kumar, R., Suresh, N., Satish, J., Sangode, J. and Kumaravel, V., 2007- Evlution of the Quaternary alluvial fan system in the Himalayan foreland basin implications for tectonic and climate decoupling. Quaternary international, V. 159, p. 6-20. Lee, H. S. and Chough, S. K., 2006- Lithostratigraphy and depositional environments of the Pyeongan Super group (Carboniferous–Permian) in the Taebaek area mid-east Korea. Asian Earth Sciences, V. 26, p. 339–352. Longhitano, S. G., Mellere, D., Steel, R. J. and Ainsworth, R. B., 2012- Tidal depositional systems in the rock record: A review and new insights. Sedimentary Geology, V. 279, pp. 2-22. Miall, A. D., 2000- Principle of Sedimentary Basin Analysis. Springer-Verlag, New York, p. 668. Miall, A. D., 2006- The Geology of Fluvial Deposits (3rd edition). Springer-Verlag, Berlin, p. 582. Read, J. F., 1985- Carbonate platform facies models. AAPG Bull., V. 69, p. 1-12. Seyed-Emami, K., Fürsich, F. T. and Wilmsen, M., 2004- Documentation and significance of tectonic events in the Northern Tabas block (East-Central Iran) during the Middle and Late Jurassic. Rivista Italiana di Paleontologia e Stratigrafia, V. 110, no. 1, p. 163-171. Sharafi, M., Ashori, M., Mahboubi, A. and Moussavi-Harami, S. R., 2012- Stratigraphyapplication of Thalassinoides ichnofabric in delineating sequence statigraphic surface (Mid- Cretaceous), Kopet- Dagh Basin, northeastern Iran. Palaeoworld, V. 21, p. 202-216. Stocklin, J., Eftekhar-Nezhad, J. and Hushmand-Zadeh, A., 1965- Geology of the Shotori Range (Tabas area, East Iran). Geological Survey of Iran, Report, no. 3, p. 69. Strand, K., 2005- Sequence stratigraphy of the silisiclastic east Puolanka Group the Palaeoproterozoic Kainuu Belt, Finland. Sedimentary Geology, V. 176, p. 149–166. Therrien, F., 2006- Depositional environments and fluvial system changes in the dinosaur-bearing Sanpetru Formation (Late Cretaceous, Romania): postorogenic sedimentation in an active extensional basin. Sedimentary Geology, V. 192, p. 183–205. Tovaglieri, F. and George, A. D., 2014- Stratigraphic architecture of an EarlyeMiddle Jurassic tidally influenced deltaic system (Plover Formation), Browse Basin, Australian North West Shelf. Marine and Petroleum Geology, V. 49, p. 59-83. Tucker, M. E., 2001- Sedimentary Petrology: Third Edition, Blackwell, Oxford, p. 260. Walker, R. G. and Plint, A. G., 1992- Wave and storm-dominated shallow marine systems. In: Walker, R.G., James, N.P. (Eds. ), Facies Models: Response to sea level change. Geological Association of Canada, p. 219-238. Wilmsen, M., Fursich, F. T., Seyed-Emami, K. and Majidifard, M. R., 2009- An overview of the stratigraphy and facies development of the Jurassic System on the Tabas Block, east-central Iran. Geological Society of London, Special Publications, V. 312, p. 323-343. Zand-Moghadam, H., Moussavi-Harami, R. and Mahboubi, A., 2014- Sequence stratigraphy of the Early–Middle Devonian succession (Padeha Formation) in Tabas Block, East-Central Iran: Implication for mixed tidal flat deposits. Palaeoworld, V. 23, p. 31-49.